Trapped. 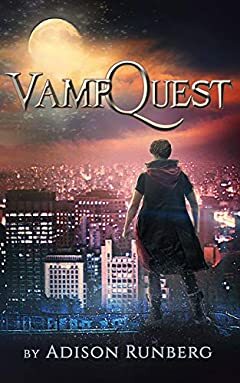 Aker is playing a fully immersive virtual reality video game, called VampQuest, but he canâ€™t quit and doesnâ€™t remember his real life. He starts to raise level and enjoy the perks of being a vampire in a game-world mostly full of humans when a rival guild attacks. The battle leaves Aker bitter and bent on revenge. He completes many missions that take him far from his guildâ€™s base but vows to return and bring peace when he is strong enough.